As discussed in our first post Customer Experience (CX) Part 1 – Is It Different than Customer Service, customer satisfaction often focuses on narrow and discrete touch points that clients are exposed to during a particular engagement. Each touch point of contact and service theoretically could be good or even excellent but the client experience still may not be perceived as excellent because it represents only a phase in the overall experience. For this reason, the first step a law firm must take is to map out the journeys that clients take over the lifecycle of an engagement, and hopefully over a long-term relationship. In mapping the journeys, they must identify – through the eyes of their clients – where the critical junctures are for delighting clients as well as where the pain points in need of improvement are surfacing. Effective journey mapping requires that an organization look at all of the touch points and operational aspects of generating awareness and engaging with and getting work done on behalf of a client. This is particularly difficult to achieve in law firms as partners often have their own way of doing things that may not follow a common path that is mandated by the firm. Partners often act independently of each other and don’t always communicate effectively with other partners and lawyers on the team, to say nothing of paralegals, contract attorneys and legal support professionals. Then there are all the other client facing and back office support personnel that clients often interact with: administrative assistants, receptionists, conference/meeting set-up attendants, billing and collections personnel, IT staff, eDiscovery and legal research professionals. Furthermore, firms often operate in silos which not only creates major challenges to service consistency but also creates potential disconnects between all the critical touch points along a client journey. 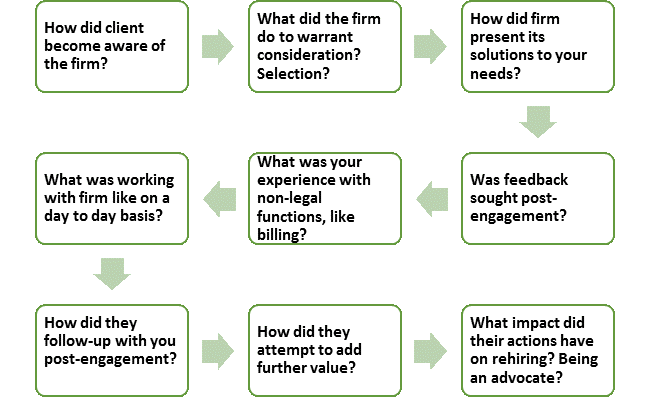 These challenges are common in most law firms but the benefits to client journey mapping are substantial and outweigh the challenges. They not only expose the plethora of ways that clients experience your firm but also provide opportunities for generating insights and data that firms can use to build a case for greater teamwork and service standards. The process of mapping out the client journey can take many forms ranging from the very basic audit of processes by current lawyers and employees (which we do not recommend as the single source of input as it does not incorporate critical client perspectives) to more extensive approaches that involve internal and external qualitative and quantitative testing, along with coordinated workshops and related implementation work-streams. While these approaches are all within the realm of the traditional, it’s worth noting that other more consumer-focused industries are utilizing approaches that incorporate methodologies such as mobile ethnographies that allow the customer to document, through screen shots, photos and video, their encounters with the brand/product/service as it is being experienced. It’s a new day and for some, seeing clear, visual evidence of the experience as it is happening can have lasting impact. At its core, client journey mapping is a qualitative process that involves seeking out the clients’ perspective on the experience, typically via an in-person or phone interview. Who conducts these interviews can vary. 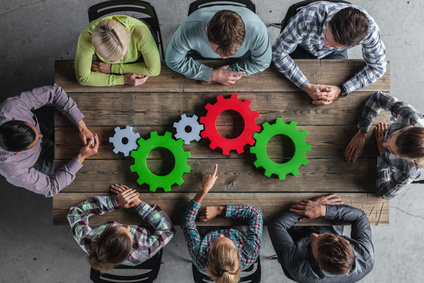 While some firms may choose to engage third-party consultants to uncover insights and aggregate client experiences across various touchpoints, others may wish to leverage internal people, perhaps a Chief Marketing Office, Chief Administrative Officer or Chief Operating Officer to lead this process. The important factor to keep in mind is that whoever is conducting the interviews knows the right questions to ask, can remain independent regardless of internal connections and loyalties, and can assimilate what they are hearing into a fair, accurate and discrete mapping exercise that lays out the different ways clients experience the firm. And as with most research, client participants should be afforded anonymity. In other words, unless the client wants his/her experiences attributed, their feedback should remain anonymous and aggregated with that others without any identification of who the feedback is coming from or who it may have been directed to. Client journey mapping is about discovery—it’s not a witch hunt. The recency of the client’s experience. In addition to identifying clients for whom the firm is actively working with on a matter or recently concluded a matter, seek out a few representative new clients who can recall, in detail, their early encounter with the firm including how they became aware of the firm and why the firm was initially considered as potential provider. The client’s team. While most initiatives will include the key decision-makers at the client, it’s important to note that the experiences of their team, be it other executives, staff attorneys, maybe even their trusted administrative assistants, can have significant influence on how these key decision-maker assesses their experience. Including a few additional client representatives from a particular engagement, especially the larger ones, may yield some valuable insight into critical touch points that the key client decision-maker has not experienced directly, but still have influence on overall impressions. Depict the journey from the client’s perspective, not the firm’s. While it may be helpful to hypothesize the client journey internally and use those internal hypotheses to potentially assess and address major gaps with the actual client experience, having the client perspective is critical for validating the experience. Provide a segment-level view where differences exist. Regardless of industry, the customer experience is rarely homogeneous. In law firms, you may want to look at the insights generated to tease out key differences in the experience based on the client participant (role/industry), type of client company or industry, or by looking at differences across different service lines and practice groups. Memorialize customer goals and emotions. Capture what the customer is feeling and trying to accomplish at different stages and points of interaction. Represent the key touch points, highlighting moments of truth and pain points. Demonstrate the order and type of touch points – including those that may be beyond the firm’s control. And recognize that some interactions and touch points have more impact than others. Identify key opportunities and barriers. The mapping exercise concludes with a prioritization of options for future focus. Our final post in this series will address approaches to activate and manage the customer experience on an ongoing basis.